Figure shows a cone with equations (formulae) for circumference, circle area, surface area, and conical volume. This cone also available as a 3D stereo anaglyph. This calculator will work out the surface area of a cone and the volume of a cone if you enter the cone radius and height. Only enter numbers (e.g. enter 22 not 22 cm). If you try to enter a unit of measure (e.g. 22 metres, 4 miles, 10 cm) you will get an NAN (Not A Number) error appear in each box. When you have entered the numbers, click the GET button. 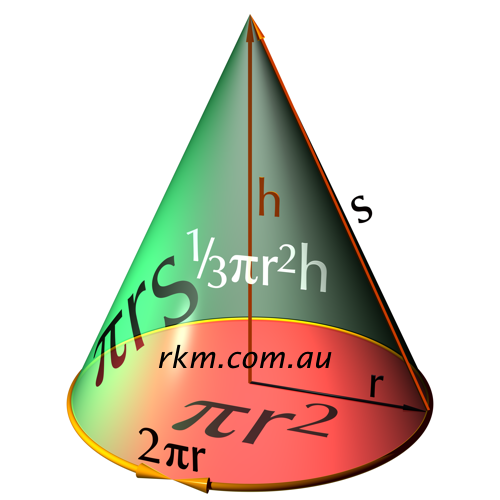 SURFACE AREA OF A CONE is the area of base (π r 2) + area of the sloping wall π r s.
VOLUME OF A CONE is the area of the base (π r 2) times the height (h) divided by three = 1/3 π r 2 h.
To convert between lengths (e.g. centimeters to inches) see our Length & Distance Converter. For weights and volumes (especially in recipes) see our Recipe Converter. Sphere: Calculate surface area and volume of a sphere.